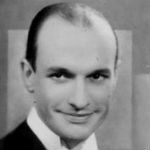 Roy Fox (October 25, 1901 – March 20, 1982) was an American-born band leader whose period of greatest popularity was in England during the British dance band era. Fox was born in Denver, Colorado. Roy began playing cornet when he was 11 years old, and by age 13 was performing in the Los Angeles Examiner‘s newsboys’ band. Soon after he played bugle for a studio owned by Cecil B. DeMille. His first major association came at the age of 16, when he joined Abe Lyman’s orchestra at the Sunset Inn in Santa Monica, where he played alongside Miff Mole, Gussie Mueller, Henry Halstead, and Gus Arnheim. He developed a soft style of playing there which earned him the nickname, “The Whispering Cornetist”. In 1920, he put together his own band, with whom he recorded in 1925. That same year he also scored a gig on radio broadcasting with Art Hickman’s orchestra; this ensemble toured the United States, then did an extended residency in Florida. After some time in New York City, Fox and Arnheim reconvened in Hollywood, working at the Ambassador Hotel, and Fox continued to broadcast with his own bands. During this time he also did a number of film soundtracks. In 1930, Fox was invited to perform in London, which he first did on September 29, 1930. He recorded on the BBC that year, and when his band returned to the U.S. the following spring, Fox remained behind, recording with a new group for Decca Records and accepting an engagement at the Monseigneur restaurant in Piccadilly.